LETTER | The Consumers’ Association of Penang (CAP) and Sahabat Alam Malaysia (SAM) are alarmed over proposals for two new hotels on Penang Hill which could contravene the Special Area Plan for Penang Hill (SAP) and pose serious risks due to landslides and soil erosion not only on the hill but will also have downstream impacts. However, we are shocked to read reports that the CM has said that one the hotels will be five-storeys high with a 200-room capacity behind the Convalescent Bungalow. How can the state allow the violation of the SAP in contravention of the law as the SAP has legal force? According to the CM, the plan for the hotel has been delayed as the construction area involves forest reserves and that has to be addressed first. The second hotel is reported to be in the planning stage. While the CM has said that the safety aspects and the landslides which have been happening in the Penang Hill area will be taken into account, we are shocked that the hotels will be built nevertheless, despite the incidence of over 200 landslides last year on Penang Hill itself. 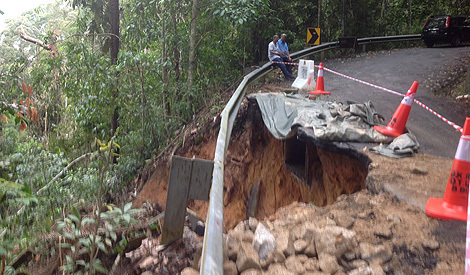 There are also other landslides that have happened beyond Penang Hill. Moreover, the recent Bukit Kukus landslide tragedy last month and the Granito landslide in the Tanjung Bunga area last year have clearly revealed the incompetence of the authorities at the state and local level in dealing with development on hillslopes. There is a glaring lack of capacity on the part of the state and the local authorities to oversee and monitor development on hills and hillslopes. There is also the inability of developers and contractors of projects in areas of the two landslide tragedies to carry out their jobs adequately otherwise these tragedies would not have happened. The SAP recognises Penang Hill as an environmentally sensitive area with very special characteristics and given this fact, the state ought to give priority in rehabilitating the landslide affected areas in Penang Hill, and take all measures to protect the hill rather than allowing the development of more hotels in an already fragile environment. Clearly, the Penang state government and the local authorities are not learning the tragic lessons of recent landslides that have involved the loss of 20 human lives already with damaging consequences to the surrounding environment. CAP and SAM call on the chief minister not to proceed with the construction and plans of the two hotels in Penang Hill in view of the extreme sensitivity of area which is highly landslide prone. This is the prudent approach as nature has already taught the state serious lessons. Let’s not make further mistakes that would cost further lives and environmental degradation. Meanwhile, the chief minister should also make public the plan and proposals for the two hotels and any other commercial activities being planned for Penang Hill so that the public can give its views on these plans. Penang Hill is a precious part of Penang’s heritage and attraction as the Pearl of the Orient and it should not be sacrificed for narrow commercial interests. The writer is CAP and SAM president.